I know, I know, I say this every month, but July has flown by. I've barely worn any makeup this month but I've got a few beauty and lifestyle favourites I want to share with you. On the few days I have worn makeup, I've been contouring with the L'oreal Infallible Sculpt Contour Palette in Light to Medium. It's a cream to powder formula that blends really nicely into the skin. The contour is quite ashy and looks really natural. I've been using the Real Techniques Contour Brush with it because the size fits perfectly into the hollows of my cheeks. The synthetic bristles blend out the cream seamlessly. 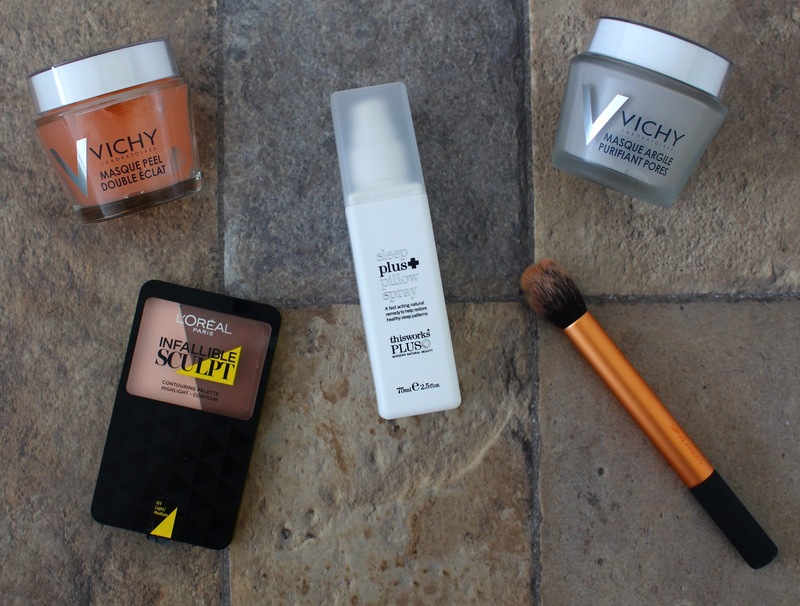 If you read my New Skincare Additions #5 post, you'll know I've been testing out Vichy's new masks. The clay and exfoliating masks are just beautiful and I'm so happy with them. The clay mask gets rid of any impurities and the exfoliating mask smoothes the skin. I still need to test them out further before I do full reviews, but so far, so darn good. I recently purchased the GHD Aura hairdryer and I am in love. It makes my hair so smooth, which is something I only ever get when I get my hair done at a salon. I have a review coming up at the end of the week, so if you've been on the fence about it, you might want to read that post. I'm not sure if this is a beauty favourite, but the This Works Deep Sleep Plus Pillow Spray is the best thing since sliced bread. It truly does help me have a deep intense sleep with little to no disturbances. I feel so refreshed when I've used it. I've been obsessed with First Aid Kit over the last couple of months. They're a Swedish folk duo and they're very different to anyone I've heard and which is why I love them. Nowadays, mainstream music all sounds the same to me and I think it's nice to have something a little more niche. I love their song EmmyLou which is just so beautiful. My blogger/Youtuber of the month is Tamara Kalinic from the Glam and Glitter. She's mainly a fashion blogger, but also does beauty. I've been binge watching her videos because she focuses on luxury items. I just love watching videos on designer shoes and handbags so I know for the future, what is truly worth it. I pretty much adore her wardrobe, especially her shoe collection. I also love the fact that she responded to a couple of questions I asked her on Twitter. Normally, I don't get a response from 'bigger' bloggers but she replied straightaway which I thought was lovely.